Sometimes it really is all about the journey. We had decided to go "overland" (i.e. 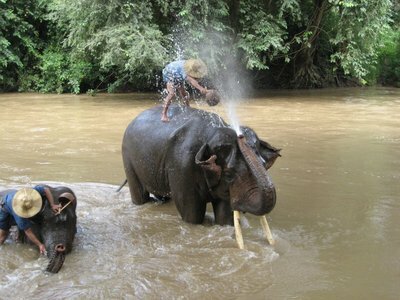 hire a car/driver) from Bangkok to Siem Reap, Cambodia. 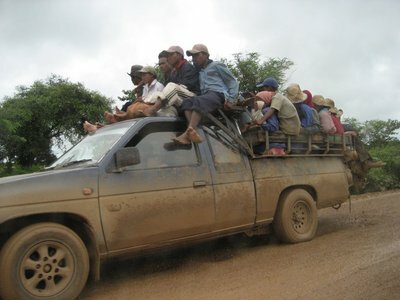 This is a long car trip, with a border crossing full of red tape, and a very spotty road on the Cambodian side. It was a trip we were worried about, and thinking of as something to get past. It turned out to be an unforgettable experience. First of all, the taxi driver we hired in Bangkok on October 12th actually did show up on time, and turned out to be a great conversationalist. His first name was Arom, and he spoke very good English. 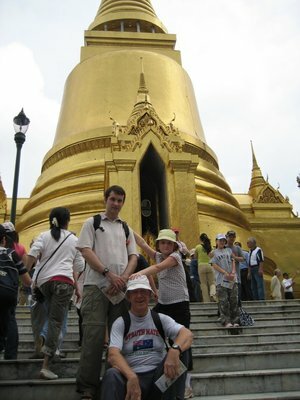 He had as many questions about us and Canada as we did about Thailand, especially after it emerged that we were travelling around the world. It scarcely mattered that the drive was three and a half hours (a little longer than we thought), as we talked with Arom the whole way. He also did his best to help us find the way to the right place at the border, even taking us on foot as far as he could legally go. The Cambodian side worked out well, especially with our e-visas in hand, and our contact from "Two Dragons Guest House" in place to show us the steps. 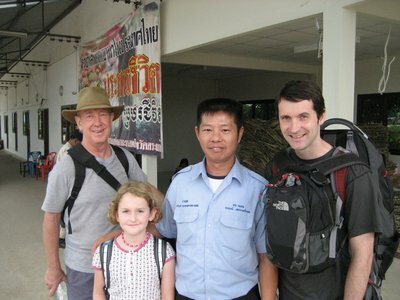 After a short bus shuttle, we were shown to our car and met the driver who would take us to Siem Reap. Unlike Arom, he spoke no English. The drive could take anywhere from 5 to 8 hours. Off we went. 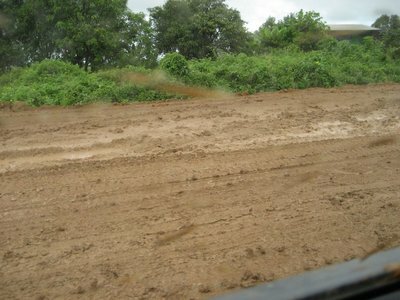 One muddy, bumpy road. Flat. Very few curves. How could it be so fascinating? 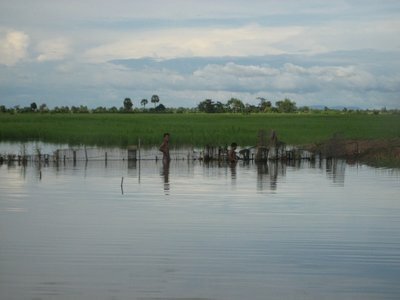 The hours flew by just because, as we looked out the window, there was so much of Cambodian life filling our view. My parents tell me that, in Switzerland, you could almost point your camera anywhere and have a picture postcard shot. Well, without even leaving the car, on this Cambodian road, anywhere you pointed your camera seemed to produce a National Geographic cover shot. The "traffic," for instance, was filled with pickup trucks being used as mass transportation, 20 to 30 people packed into and onto them. Cows and water buffalos caused slowdowns. Wherever the water in the ditches was deep enough, children swam naked, and people of all ages waded in with their clothes on. It's still the rainy season, and bathers take advantage. 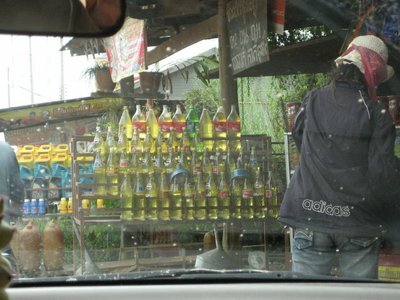 A "gas station" meant a rack of old Pepsi bottles at the side of the road, filled with gasoline. Sometimes our conversation halted because it got so bumpy we couldn't talk. Eventually, our driver called out "toilet?" and we made our only brief stop. A young boy washed the mud off our car. 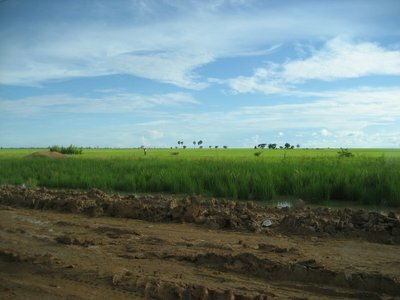 About two hours after this stop, we arrived in Siem Reap. It was just about 6PM, 11 hours after we left Bangkok. We were shocked to see the many luxury hotels after hours of seeing people living in stilt houses best described as shacks. Our own guest house was much more modest, but still clean and welcoming. Gordon, the owner, had turned out to be a great contact that Jenn developed through her on-line research. Today we got in a taxi to the Border. it took from 7:00-12:00 (noon). stopped for a snack break along the way. When we got to the border between Thailand and Cambodia, it took us 45 min to get past (even with e-visa). Wow. Then taxi to two dragons guest house. it was about 5 hours (on a really bumpy road). finally got there and had dinner and choco ice cream. Good night. I mean it. We've seen many incredible things on our trip so far, but Angkor Wat is now my favourite. Actually, not just "Angkor Wat," which is a specific temple complex, but the Khmer temples of Angkor in general, which we have spent the last two days touring. At eight hours plus per day, we saw many different temples. Like the Great Wall of China, this is a physical experience; you don't just "see," you climb, you duck your head, you sweat. We had an official tour guide and a driver, which was great because the tour guides are very knowledgable and well-trained and know exactly how to get you around to all the best temples and views. 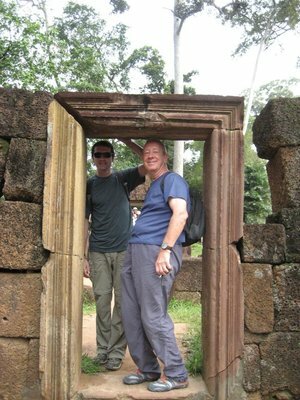 We started, for example, with Ta Prohm. 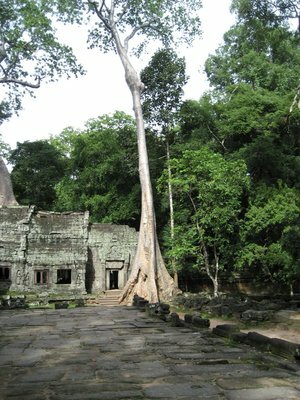 Other than the towers of Angkor Wat, this is the classic overgrown jungle atmosphere: huge trees, and tree roots growing up, through and around the temples. 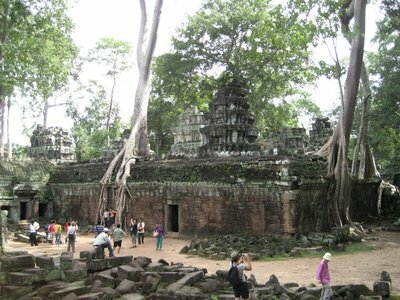 Most of Angkor is not like this, we found out as we continued. Instead of overgrown and claustrophobic, the grandest complexes are still spacious and commanding. 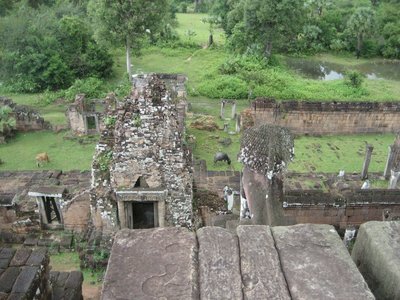 They were never forgotten by the Khmer people, although they did fall into disrepair. 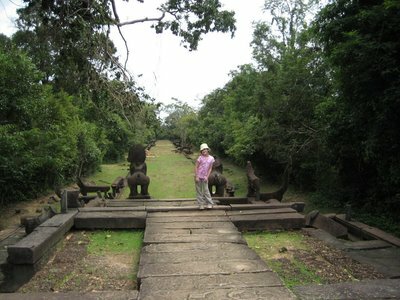 After that, we entered Angkor Thom. It is the ancient capital, contained by a moat that is a 14 kilometre rectangle, 100 metres wide. Inside, we saw several temple areas, including the very steep and high Bayon temple, where a staircase has been built on one side for people to climb. Even that is very steep. The highlight of the afternoon was going to Angkor Wat, with the famous view from the causeway. The bas relief carvings in the galleries are the main interior feature, and tell the story of the Hindu epics. Our tour guide was very enthusiastic and detailed in describing these. In fact, it was too much, even for me, let alone Anica, to be able to follow or keep interest in. The second day provided us with an idea of the variety and distance that the temples cover. 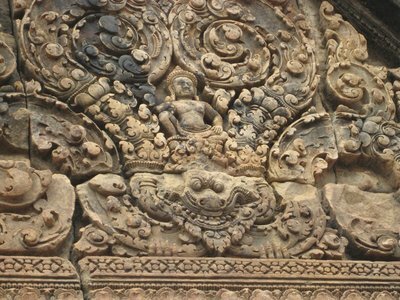 Banteay Srei, for instance, was about 35 km to the north, and did not rise high, but receded through doorway after doorway, covered with intricate sandstone carvings on each lintel. 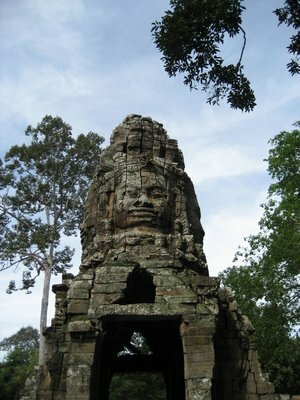 Banteay Samre, next, was several kilometres east of all the others, and similar to Angkor Wat, except that its causeway extended into the jungle and not over water. As we entered, school children in white and blue uniforms waved as they passed, skirting the temple walls on their way home for lunch. Other children hawked products with a hard sell and hardluck tale. Some have memorized facts about every country to impress potential buyers. A boy gave me this spiel, in one breathless litany: "Canada. I could say hello in your two official languages, English or French. Population 35 million. Your capital is Ottawa. Do you have a loonie, toonie, quarter, dime or nickel? Buy my book. Just five dollars. You need water? One dollar." Well, he knew more about Canada than many of our American neighbours seem to, that's for sure. 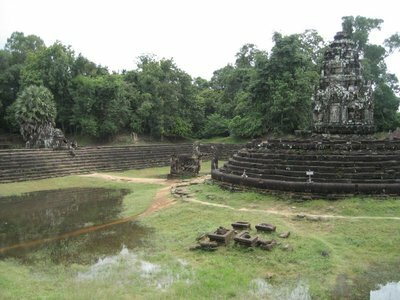 Neak Pean temple really stood out, with its circular structure inside a drained moat. It used to be a "hospital," and four doctors' huts still stand at the forest's edge. Each direction of the compass had a different animal's-head shrine, from which people drank holy water to be healed. East Mebon temple, also very tall, once towered over a huge resevoir, so it was fun to stand at the top and imagine the extent of the waters. 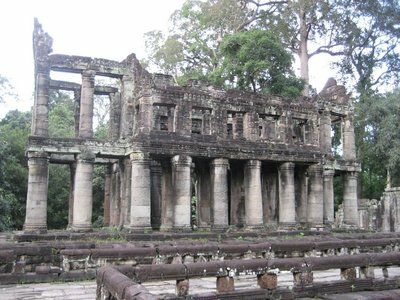 We finished with Preah Khan, which was one too many for Anica, and Jenn stayed behind with her while James and I soldiered on. Anica, although she seldom listened to the tour guide, showed amazing endurance in the heat and humidity of our long days. She loved the climbing and the views, and was patient with the religious and historical details. Meanwhile, the city of Siem Reap has turned out to be quite charming. Two million visitors a year, most of whom arrive by plane, mean that it's quite a contrast to the Cambodia we saw on our way here. There's a new museum about to open, a theatre, and the river running through the centre of town is well-maintained as a park and its bridges are lit with twinkling white lights at night. There's also a sign in front of the hospital, however, which calls for blood donors because of a "hemmoraghic dengue fever epidemic." 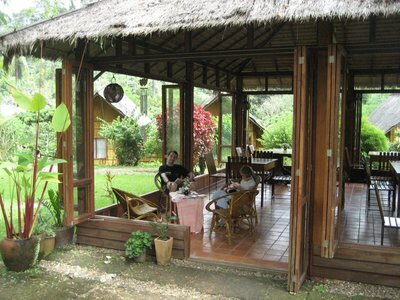 Our guest house is clean and comfortable, and there are many restaurants to choose from nearby. Our time here has been made more memorable by meeting a family from Holland with two kids. Their daughter, Marisa, is the same age as Anica and their son, Igor, is four. Great people! After spending two evenings together, we have made plans to see them again in The Netherlands in the spring. They are on their own world trip of six months, and have been mainly in Thailand and Vietnam so far, with two months in New Zealand coming up, so we had lots to talk about. James (Jenn's Dad) has even more travel experience and wisdom, so we all like to hear his perspective. Last night all eight of us walked into the old market neighborhood and had a pizza dinner together at "Escatic Pizza." It was the first time we'd had non-Western food in several days, and the little local Italian/Khmer place was a great way to get to know each other better. Ignoring the advice that we needed tuk-tuks to get back to the guest house, we walked, with the help of James' flashlight. All three kids, however, are veterans of Hanoi's motorbike traffic, so Siem Reap is positively quiet in comparison. This third day in Siem Reap will be about sleeping in, resting, and seeing more of the Old Market/downtown area during the day. It's funny, by the way, that the de facto currency of Cambodia is the U.S. dollar, and for the first time in years, the Canadian dollar is at par or better in comparison. Great timing! Today we got to see some Temples. One, Ta Prohm, a big one with tree roots and lots of other things. Then went to elephant terrace with no elephants in site. then we went to one called Bayon with a big staircas and steap steps. 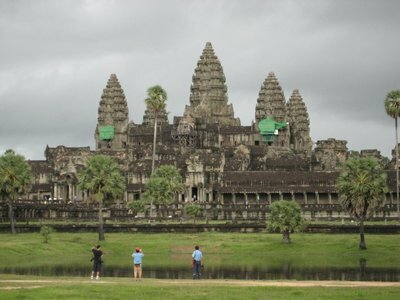 then went to Angkor Wat, beatifull, but then it was only a Hindu pic gallery [inside]. 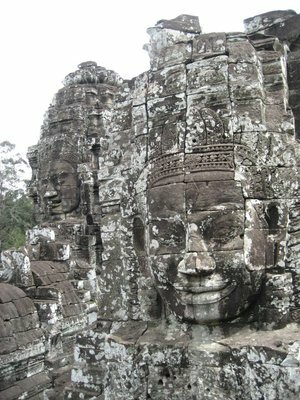 My faverite temple was Bayon because of staires. Good night. and meeting up with Jenn's Dad! It was back to the big city after our nights in Chiang Dao. For the whole day before we arrived in Bangkok, Anica kept saying: "Guess who we're seeing tomorrow? Poppa!" over and over. We did indeed meet Jenn's dad (a.k.a. Poppa) in Bangkok, as planned. Sort of. He didn't stick around the hotel to wait for us, and instead we caught up with him at a huge, glitzy shopping cente called the "Siam Paragon." Getting there gave us our first taste of rush-hour Bangkok traffic, where a 6 km taxi ride can take the better part of an hour. Anica had her moment of yelling "Poppa" and running into his arms, and then our little three-person travel unit became four. We will see Bangkok, Cambodia and India together. Jenn and I knew that this would be a major adjustment after being on the road for two and a half months, but definitely worth it to share these experiences with (more) family. 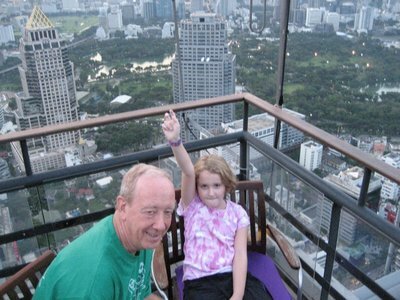 That very first night in Bangkok Jenn's Dad treated us to an unforgettable dinner at the Banyan Tree hotel's rooftop restaurant. This is 61 floors up...and open-air. We were there at sunset and it was stunning. Then, to cap off the evening, we went to the night market just up the street, which was surprisingly upscale in selection and chic in appearance. Our time in Bangkok has seemed short, but we've managed to do a few things between snail's pace taxi rides (which were still the cheapest way for four to travel) and thunderstorms (which never lasted as long as a taxi ride). We braved the incredibly tight alleyways of Chinatown looking for bargains, for instance. We ate some good Thai food, once near our hotel, once at a food court, and once at a tapas-style restaurant (called "Thaipaz", get it?) which was so difficult to find we nearly gave up. 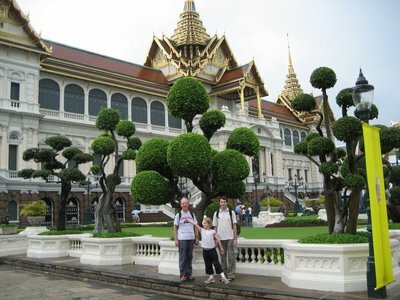 And of course we saw the Grand Palace and the Wat Phra Kaeo royal temple complex. This was truly beautiful. Built in 1782, it is so well-maintained that all of shines as if new (what a contrast to the 1804 palace in Hue, Vietnam - now mostly in ruins). The colours are amplified by all the glass, which itself looks like jewels. 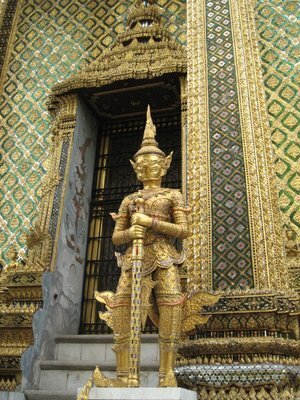 I don't know how much I learned about Thai Buddhism or the monarchy, but aesthetically, this was everything you could hope or imagine to see in a royal palace and temple grounds. Again, the word that comes to mind is dazzling. Fortunately, too, today, we decided to take a combination of the Skytrain and the ferry-boat back to our hotel from the downtown core. Yes, it did cost more than a taxi, but not by much, and the "Central Pier" ferry trip was a great Bangkok experience. We rocked and whooshed our way back and forth across the river through 13 stops, and when we finally got off, we just walked down an alleyway, and were practically in front of our hotel. Now, we'll see about getting from here, overland, to Siem Reap. Bangkok has really been just warm-up. Welcome aboard, Poppa! Today we got to Bangkok after a hour and a hald drive from Chang dao nest and a hour and 10 mins from Chang Mai airport on Air Asia. After a pretty long public taxi ride to New Siam II hotel, when we got to it Poppa wasen't there yet so after a couple minutes, poppa called us and said (on phone) "I'm at the Siam Paragon just at a starbucks at the front. So we got a taxi down and met Poppa and had a good dinner at a fancy restaurant with a kids meal After that we went to the night market and went to sleep. Good night. Next day we went to mommys densit and we shopped at Central, then we went to Chinatown to look around and went thourh a really "busy" market and went to a tourist street close to our hotel and had lunch at a place showing Harry Poetter and the order of the phoenix. after we went to our hotel to go swimming and had dinner. Good night. Next day we went to the old palace (not as insreting as Beijings) and got rained on. then took a taxi to Siam Paragon and had a good lunch. Then we took a sky train to the boat peir and rode it to our closet peir and had dinner. Good night. A Report on our stay at the "Chiang Dao Nest"
Our last day in Ho Chi Minh was mostly spent waiting around for our flight in the early evening. We might have done more but it was insanely hot and then rained like crazy. We had a lovely pizza lunch (fries smothered with cheese for Anica) at Pepperoni's and then looked around the streets and side streets until it was time for our car. 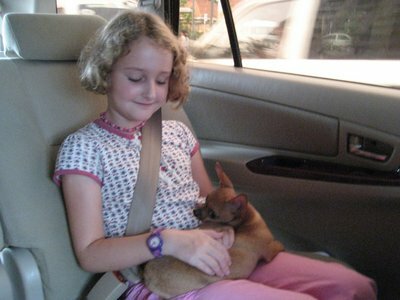 The chihuahua got to accompany us again and Anica was over the moon. The delicious food at the airport helped and our upgrade to flying with Bangkok Airways (when we paid for Pacific) was nice too! Next morning we had a huge breakfast on a very small table. At one point there were 12 glasses of liquid (water, juice, milk, coffee or hot chocolate for each of us). We were very amused. Breakfast was delicious though and after checking email on the computer in the lobby it was time to check out and head for the airport. The Bangkok Airport was amazing. Huge, with flights going everywhere imaginable. Lots of shops and restaurants. Apparently our carrier - Air Asia - is the only domestic carrier to go out of the international airport. Our flight was on time (well, twenty minutes late but that's on time in Asia) and our car was waiting for us at the other end. Car? It was a huge air-conditioned minivan waiting to take us the 90 minutes to Chiang Dao, halfway between Chiang Mai and Chiang Rai. 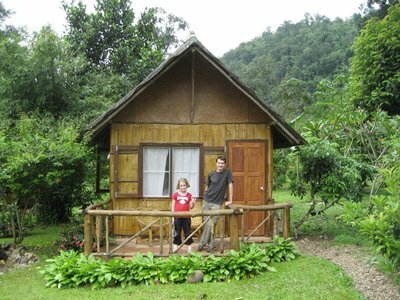 Our "resort" there - Chiang Dao Nest - proved to be incredibly rustic. It's comprised of small cabins cooled by screened windows and fans, with attached bathrooms. The scenery is stunning though and the food, god, /amazing/. Wicha and her husband Stuart own and run the Nests (there's two) and Wicha does the cooking for Nest 1 (European cuisine) and her sister does the cooking for Nest 2 (homestyle Thai cuisine). Wicha was trained as a chef in London and it shows. We're not saving a lot of money here on food by Thai standards but by Canadian, we'd have to pay 3-4 times what we're paying to get an equivalent meal. and we managed some very hot and spicy Thai food at Nest 2 before climbing through the also-nearby caves with a guide (paid 100 baht to be shown through 4 caves with a gas-lantern for light). Very cool. All of it. Yes, very cool. Not just the gourmet cuisine in the "we're-practically-camping-it's-so-rustic" setting, but also the things to do around here, and the views. We've had a lot of rain, but not constant, so that means there's been an ever-changing mist rising and falling over the mountains. 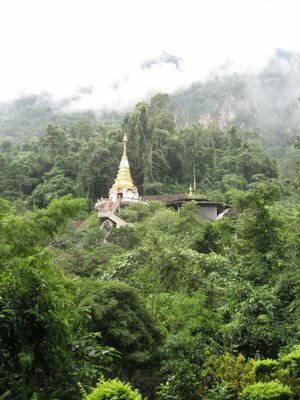 The "nest" is hemmed into this narrow valley, and when we were at the top of the monastery we could see down its length, to the next mountain range, which may have been across the border in Burma. The caves were great, too, because we just walked over, not expecting much. It's a good thing we were guided, though, because we never would have thought to squeeze through the narrow openings that led to the next big vault. In this way, we saw four separate caves. It seemed the higher the ceiling, the more bats it had. Anica had expressed some worry about this, but she was very brave, and really enjoyed herself. Nor did the very large spider frighten here (actually, I think it was the biggest spider I've ever seen, just sitting there on a rock in front of us when the guide raised her lantern). When we got back, Anica got to play with the owners' son and a couple of other boys. They played soccer with our inflatable ball, and "What time is it, Mr. Wolf," where the steps were counted in Thai. Jenn and I chatted with Wicha and some other guests, and worked up an appetite for another fabulous dinner. Today we got breakfast and walked up the 500 steps to a monstray, and took of are shoes. after that we walke to nest 2 and had a delicious Thai lunch. 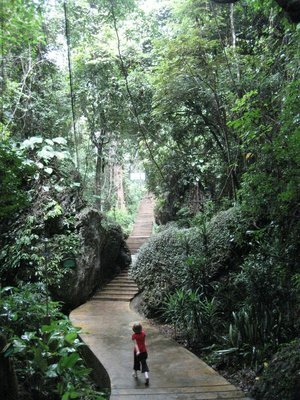 Walked to Chiang Dao cave (!) 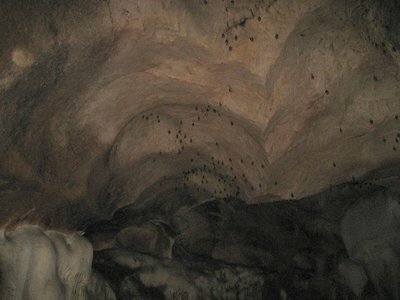 nd saw some baby and grown up bats and fee sacred fish (outside the cave). Walked back to nest 1 and played ball with Joseph (their son) till 7:00. We had some yummy sasuge and pizza with him and me and my mummy had some chocolte cheesecake. Said good night and walked back to cabin and went to bed. Good night. Possibly the best day of the trip so far, and certainly our best sightseeing tour day. Through Chiang Dao Nest, we arranged a full day of activities, and we were lucky to get a really nice tour guide named "Tory." He even sang songs and told children's stories to Anica. Today was also the first day we haven't had rain since we left Saigon, so it was great timing that way. The first part of the day was all about elephants. We went to an elephant training center, where elephants who would have once worked in logging now work displaying their skills and carrying tourists. First we saw them have their bath, then we moved to an amphitheatre where we saw a display of the traditional skills like stacking logs. Who's giving who a bath? And also some non-traditional skills like painting with brushes! Anica also got to feed bananas to a mother and baby. Then, the best part: a 90-minute ride along a riverbed. 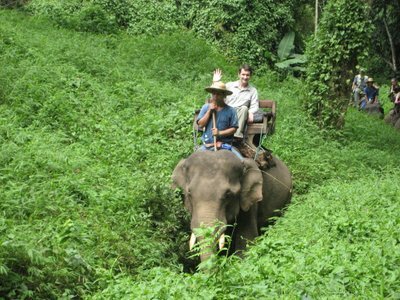 We sat on benches atop an elephant with the handler in front of us. Anica and Jenn shared an elephant, so I got my own. Aside from being jostled a bit, it was pretty comfortable. 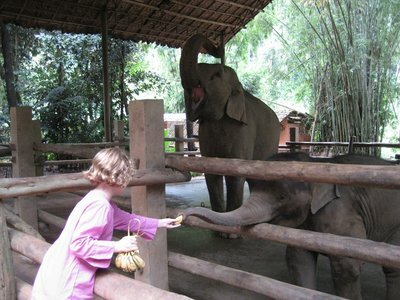 Everyone shouted whenever an elephant peed or pooped, and that's always a hit with Anica. We had a packed lunch at Tory's house, which is also a coffeeshop. Because it was packed by Chiang Dao Nest, it was exceptionally good. Much, much better than the lunches I pack myself for work! 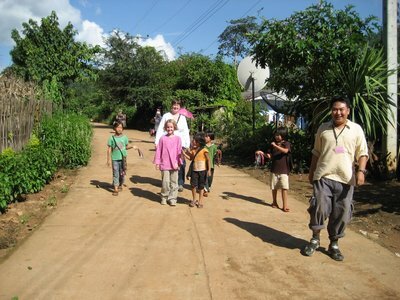 Then we toured the hill tribe area. 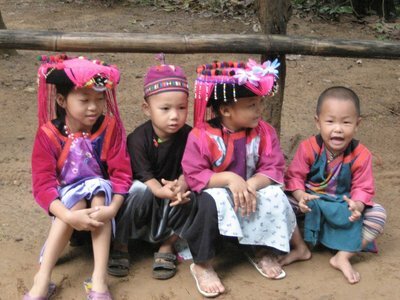 The five tribes we saw have come originally from Burma, China, even Tibet, and now have full Thai citizenship and education. But the land is set aside in a reserve-like system and the villages have few modern conveniences. We did see the famous "long-neck" ladies of the Karen tribe, which was actually kind of sad. A girl Anica's age had her first neck rings on, for instance. Meanwhile, fewer than half of the Karen women still wear the neck rings. One of the big reasons they still do is for tourists. Like us. I guess we were a part of the problem today. The Palaung tribe, on the other hand, seem more involved in making teak products, and we wandered through their village without being bothered by "hawkers." Not so with the Akha tribe, whose children were very persistent in trying to sell their products. "Ten baht, ten baht" went the refrain. Their adult women are the ones who wear the crown-like hats. Another tribe's women wore multiple belts, or waistbands, including ones of silver. So, although the villages looked similar, there was lots of variety among these tribes. This whole area was so scenic. We saw Chiang Dao mountain from farther back, which is 2250 metres above sea level. We saw rolling hills, rice paddies and "mountain rice" fields, forests of teak, rubber and bamboo, and also the "Colourful Cliff," so named for its white, red and brown streaking. Finally we finished the day with a 40-minute bamboo raft ride. We took off our socks and shoes and floated (swiftly, because of all the rain recently) down the Ping River. 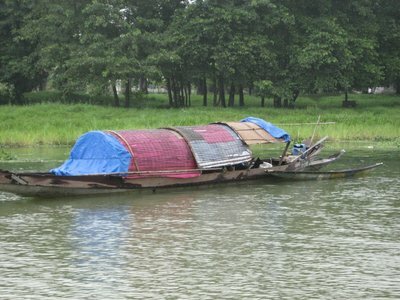 "See you in Bangok in ten days," joked Tory, as he drove off with our footwear to meet us downstream. Anica has wanted to ride a bamboo raft since she got sick on the last day in Yangshuo, and she was delighted by today's ride. When we arrived back at Chiang Dao Nest, we knew we were tired enough and soon would be hungry enough, to enjoy another great meal tonight. The only thing that's cast a shadow on this day is that Jenn has three dozen mosquito bites from yesterday, despite her best efforts with the deet. I have none, but Anica does have a couple. The big concern is that they're from daytime and/or dusk mosquitos and could carry Dengue. Today we had some Breakfast and met Tory our tour guide. the people on the tour where called Rob, Jenn and Anica, nobody else (ha ha). Probly about 30 min. till we got to the Elphant place, fed baby and mommy and watched them both move logs. rode back and went to vist the Karen long necks. Went to have lunch, and saw Palon belts, Karen big earring, and saw Akha poor (tribe). Went bamboo rafting and went back to hotel. rested, had dinner, good night. A quiet day around the "nest" today. We did opt for the Thai massages, however. Jenn and I had them side-by-side for two hours. At times, I must admit, I felt like we were being simultaneously beat up by two middle-age Thai women. 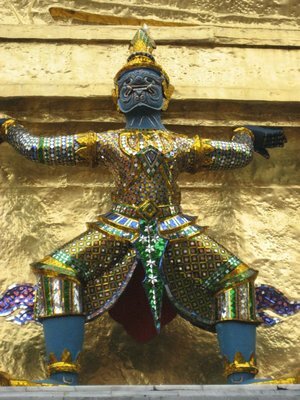 Perhaps you're familiar with Thai Boxing, where there's lots of punches, and some kicking, too? Well, Thai massage seemed simliar. Someone once described it as yoga done to you, rather than by you. Very apt. That made it tricky for me, since I can't even sit cross-legged, I'm so inflexible. My masseuse called over to Jenn's and they both had a go in an effort to get me loose enough. There were parts of it we really liked, like the hot compresses, and it certainly was an interesting experience, but we both agreed it wasn't really "our thing." Today we had a very yummy Breakfast and I did my diary and played ball with Daddy. After that we got my nitendo and I played for a long time. Then whell Mommy and Daddy had a Thai massage I played with Alice and Joseph. Me and Joseph decided to play Docter. (Dr.) Joseph was a worlds nomads Docter, and I was reciptan with a pretand passport checker and a box with one mento inside (real). Had dinner. Good night. We were delighted to see that Tory would be our tour guide again today. He took us to "The Queen's Gardens," where orchids and many, many other kinds of flowers, trees, and vegetables were cultivated. Appartently, the Thai Queen comes every month, and is so relaxed in Chiang Dao she drops the royal wave bit, and usually does some karaoke. She keeps a modest vacation home on the garden grounds, which we did see. Then we went to a waterfall, which was really fun, because you could climb across it and even up it. The ground around it was slippery, but the rocks of the waterfall weren't at all, and Anica climbed right to the top. Keeping on a theme, we drove next to a hot springs and we changed into bathing suits and immersed ourselves. It was hotter than any whirlpool/hot-tub I've ever been in, just bearable, really. Finally we had lunch. We asked Tory if there was somewhere we could eat our packed lunches that didn't have a lot of mosquitoes. He then drove us to our final tour stop, a Burmese-style temple at the top of a hill. We ate right in the temple, cross-legged on a mat. The only other person there was a guy working on the pagoda. Tory is a Buddhist, so we figured it must have been okay, but we still tried to be respectful. At least, until he encouraged Anica to have a go at the prayer bells and gongs. Now a seasoned traveller, she asked, "Does it cost?" Since the answer was no, she cut loose. Meanwhile, the view outside was irresistably spectacular. 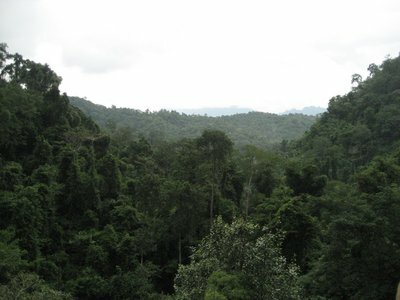 We could see the whole of the valley, and the Chiang Dao and Lady mountains across from us. It was the best view we had from up high in this area, and a great way to end the day's sightseeing. NOTE: although we initially don't have any photos uploaded from Oct 10th, there are a few more from Chiang Dao in our photo gallery. Before we get to Ho Chi Minh City, a few more words about the Orchid Hotel in Hue. This was simply the best hotel we've stayed in, mainly because of the staff there. We paid only $38 a night, including breakfast, and yes, the room was beautiful, but the level of service was astounding. More than that, though, the Orchid staff seem to really enjoy getting to know their guests. Anica wanted her picture taken with some of the people who work there, including the irrepressible "Chi." Then, on the morning we were checking out, Anica drew a picture and gave it to Chi. A few minutes later, Chi brought a wrapped present to our breakfast table, Inside was a little doll (that looked a little like Anica, but more like her cousin Lauren!). That's not something you could ever expect, but it was a lovely morning. Everyone (from the manager to the bellhops) came to say goodbye (and hug Anica) as we checked out. We were on the way to Da Nang's airport for our flight to HCMC. No, not an overnight train! Jenn had succeeded in getting us a flight for about $130 for all three of us. One hour in the air versus 23 on the train - yay! Da Nang is about 150 km from Hue, and we arranged for a "private car," as they're called, since the drive is so scenic. Unlike the bus or train, for example, we got to take the mountain pass road into Da Nang instead of the tunnel. After winding slowly up the Marble Mountains, the road crests and is flanked by American pillboxes. We also got to see traditional fishing structures, and stretch our legs at a beach resort, where, despite the bad weather, we enjoyed watching huge waves rolling in. The whole drive reminded me of Highway 1 in California, south of San Francisco. After a short hop flight to Ho Chi Minh City (HCMC or still Saigon, for short), we were greeted at the airport by the driver the hotel sent. He took our luggage and put a chihuahua in Anica's arms. As in, a real dog. Anica's favourite breed! She got to hold him for the whole ride, and he fell asleep in her lap. She was thrilled. Apparently, he belongs to someone at the hotel, and his name is "Bum" (maybe "baum," but it sure sounded like "bum" at first). For dinner, we headed for a popular spot nearby, and soon struck up a conversation with an Australian family, with a boy, 8, and girl, 11. Since everyone was enjoying talking, we stayed a couple of extra hours. One weird feature of the place was this little street kid who wandered in all the time trying to sell gum (meanwhile his mom's outside trying to sell gum on the street). He's so young, though, (5 at the most), that he hardly knows what he's being asked to do, and ends up playing in the restaurant. Before we left, he was jumping around on the pool table and rolling the balls. Even that seemed generally tolerated by the management. To us, it was funny and sad at the same time. Today we got in a car to Danang Airport. When we got ther we were 3 hours before checkin (ghost town). finally checked and got on Pacific Air and got to Ho Chi Mna or Saigon Airport, got bags and found our driver, with a big sign and with the cutest chihuahua. Handed it over right away and was on my lap for the whole ride (slepping). Got to hotel and had dinner. good night. bigger hit, and we didn't even notice it had started raining again until we towelled off and headed back to the hotel. I woke up in the morning and Mommy said come on, were going to a Amusmesment park. "yay!" So we went out got breakfast and tour booked. Got moneyy from ATM and got taxi. When we got there it was beatiful. We got tickets and went inside and the fun began. we walked to a Phoenix Palace and got in a boat (indoor) and saw a cave full of not real cavemans, animals an a phoenix and dragons. After we jumped on (fake) lilly pads, went to feris whell and road it. Saw unicorn palace which turned out to be hell. "lets get out" then went to see crocodiles and road a peddle roller coster and challenger thing that you can ride, a eltric go cart and playground. 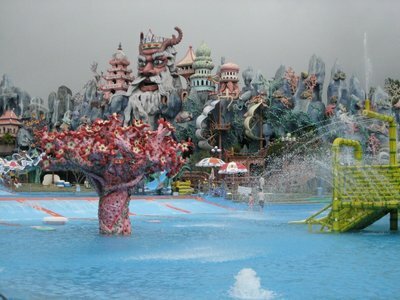 Non bouncy castle and a big hug water park, a dragon waterslide and more. had dinner. good night. Today we took a day trip outside Ho Chi Minh City. We started early, with breakfast at Sinh Cafe, just around the corner from our hotel then waited for our bus in front of their travel agency. The bus was nice and clean and not quite full with a good mixture of travellers including three other Canadians. It was a 3.5 hour ride to the Cao Dai Cathedral, northwest of Cu Chi. The Cathedral is the Holy See of the Cao Dai religion, a faith that was founded in 1926 as a fusion of several different religions - Catholicism, Buddhism, Taoism and Confucianism. The Cathedral itself was built starting in 1936 and completed in 1955. It's very fancy, mixing several different architectural styles and motifs and really something else to behold. The service itself was not as interesting as we hoped though and Anica declared herself "disappointed". After seeing the Cathedral and service, we went for lunch at a nearby restaurant. Almost everyone on the bus, with the exception of ourselves and one other couple, looked horrified at the choice - a streetside "local" cafe - but they soon followed and the food proved good, hot and cheap. Another 1.5 hour drive and we reached the Cu Chi tunnels. The tunnels were originally built by anti-colonial Viet Minh during the late 1940s but during the "American War", the tunnels were expanded until 250km of tunnels crisscrossed Cu Chi and surrounding areas. The tunnels were comprised of several levels and many different kinds of rooms including shops, living quarters, meeting rooms, schools, etc. Farming was possible at night but sometimes the residents had to stay below for weeks. American efforts to empty the tunnels proved futile as the average soldier could not fit inside them and those that could - "tunnel rats" - faced various traps and bombs. Rob declined the opportunity to try out a M16 or AK47 for a mere 15000 dong per bullet at the firing range. In fact, none of the Canadians took advantage. We're not sure if it's a cultural thing or what, but for Anica, who walked around with her hands over her ears, it was the least favourite part of the tour. After the tunnels, we made our way back to HCMC and settled in at Cafe 333 for dinner before retiring for the night. Today we went on a very long bus ride to a temple and saw people praying at exactly 12:00-12:30 pm (4 times a day). Had lunch and drove back to Cu Chi tunnels. Daddy went in one that had leaves over it so no U.S.A. army would discover. Tunnles very narrow and tiny. And we got wet shoes. When the guy with the flashlight in a army suite went to front [of the tunnel we were crawling through, we yelled] LIGHT! Me: "when are we getting out. i'd be very glad it it was soon" (Ha) Road back and had dinner at 333 cafe. Good Night. A typical mixed bag of activities comprised our last full day in Saigon (I've given up on calling it Ho Chi Minh City), including sleeping in. We went to the War Remnants Museum, which didn't pull any punches in showing the horror and devastation of the post-1945 wars in Vietnam. They have an impressive photo collection, a room devoted to war crimes, and a re-created "Tiger Cage," a prison where political prisoners were kept and tortured. Anica took it all in, even the Agent Orange victim photos. She had a lot of questions. 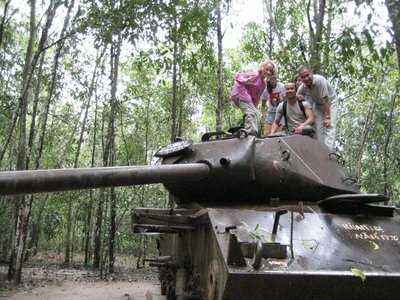 The museum also has recovered American equipment, such as a pair of F-37 bombers and a tank just like the one Anica climbed on yesterday in Cu Chi. The musuem actually closed from noon to 1:30, which was annoying, because we were about halfway through seeing it. We spent the time in the big park nearby, where there was a nice playground and Anica found some playmates. After the War Museum (Anica said she Canada's was easier to understand), we had a major change of pace and headed to the Parkson Plaza. This international department store is the closest thing Vietnam has to an indoor shopping mall, and we even played some arcade games on the top floor. Actually buying something (and all we wanted were socks!) was much trickier, just one of the small differences in culture that are often as surprising as the big ones. Vietnam turned out to be much easier to travel in than we expected, and the people have been great. We'll leave tomorrow very glad we spent time here. Tooday we walked to a park and saw scuptere park. After it we walked to war musem and saw drawn pictures (by kids). By time we had seen half of it, it was closing time till 1:30. We walked back to the park and played in a big, big playground. We went back to the war musem and saw the prizons, really big bad prisons. after a taxi to parkson and a lunch of Pho 24 noodles and Lotteria, we went to a bowling alley and arcade games. We played video games and had new zeland ice cream. We got a taxi back to the hotel and had dinner. Good night. We got to Hue Train staion and saw sign that said Orichad hotel. got to Hotel. Very nice, warm welcome. let us have breakfast. saw room. Big, clean, large bathroom. watched T.V. Had lunch at la carambole and saw river. went back to hotel, rested, got Mr. Beans Holiday, rested. Had dinner at Ushis and got pringals and watched Mr. Beans Hoilday. Good night (teddy). We slept with an old Vietnamese man last night. Well, shared a cabin on an overnight train with him. For a family of three, there's always that fourth berth to worry about. He turned out to be quite a health nut: up every two hours for a cigarette in the hallway, rising at 4:30 AM to eat (noisily), followed by a nice can of beer at 7 in the morning. The train itself was in the worst condition of the ones we've been on. "If this is soft sleeper..." is the obvious running joke. It's motivated Jenn to find a cheap flight to Ho Chi Minh City rather than face a fifth night on the train in just over 2 weeks. Pleasant, however, was our arrival in Hue. Someone from our hotel picked us up for free, and we found that the Orchid Hotel is yet another lovely budget hotel. It's that rare room that's even nicer than the lobby. They encouraged us to have breakfast - no extra charge - before we even checked in. We found out later that our room is one of just two suites they have, a free, un-asked for upgrade. The staff here also have a great sense of humour, which was quite surprising at first. We explored the next street over and found it lined with cafes and restaurants - just what we needed for lunch, then a nice dinner later, with very little in between except a walk to the riverfront and some rest in the hotel room. Hue seems so much more wide open than Hanoi's old quarter, and also quieter. Another nice thing about our hotel is that they have free DVDs, and a player in each room, so we took advantage and watched Mr. Bean's Holiday. Hey, we're better travellers than he is! We had breakfast and met tour guy who lead us to our boat and went to pagoda temple with some cool things. Then we went to a place where we had to ride [on] motorbikes and I diden't want to but I said ok. As I reasiled we had to go fast and downhill. So I burst into tears before we could get any further. I said no. So Mommy said to the driver sorry and we got to sit down and have drink and watched and talked with the faimly who was selling them. Saw dog, chicks, etc, turkey, and chicks. And then they got a box and inside were the littlest kittens I had ever senn. Her: "one week old." Me: "Wow, neat." I got (because their mother wasn't their) to pet and pick them up. Had lunch, went to see some tombs, and to our hotel. had dinner and watched Evan Almighty (so Daddy could finally see it). Good night. We booked a boat tour to some of the sites today. The Perfume River doesn't live up to the romance of its name, but at least it doesn't stink either. We were once again daytrippers in a United Nations of tourists, and all nationalities realized how we got ripped off for small hidden costs at every turn. Oh well, just a nuisance, really. The tourist boats are run by families who also live on them, and our tour guide was a qualfied teacher who told me that teaching doesn't make as much money. Our ride took us past other family house/working boats, some of which seemed to be employed at pulling weeds out of the river, or hauling dirt around. So, by tourist boat, we saw the Thien Mu Pagoda first. 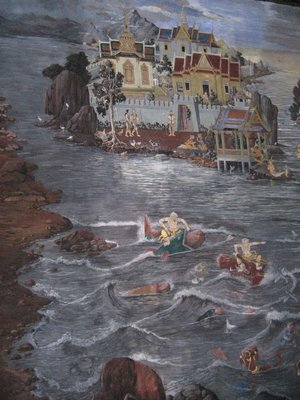 It's most famous as the monastery that trained the monk who set himself on fire in Saigon to protest the war. 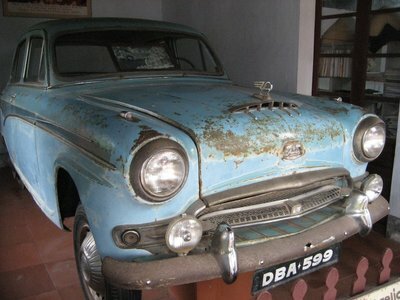 They now have his car, which he drove from Hue to Saigon in 1963, as a relic. 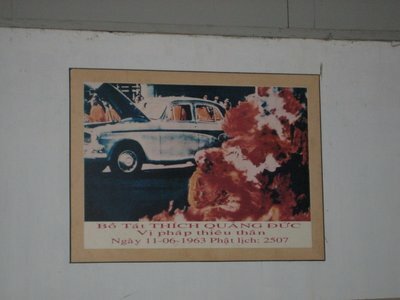 Below is a picture of the car, and of his self-immolation (notice the powder-blue Austin in the background). Next it was a selection of Royal Mausoleums. 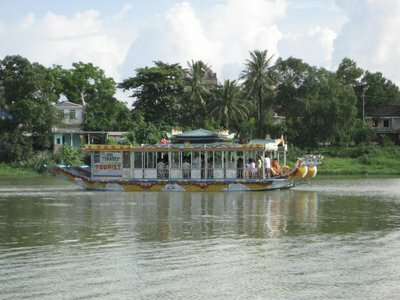 There are several Nguyen dynasty emperors who chose "auspicious sites" just off the Perfume River. Unfortunately, the first one required a short motorbike shuttle, so Jenn stayed back with Anica. 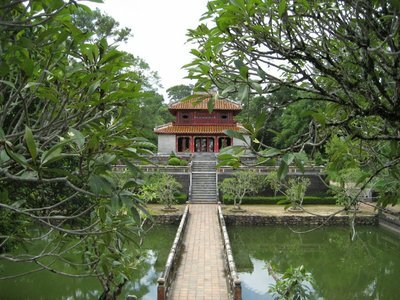 I was whisked away to see the Mausoleum of Tu Duc, which was built between 1864-1867. 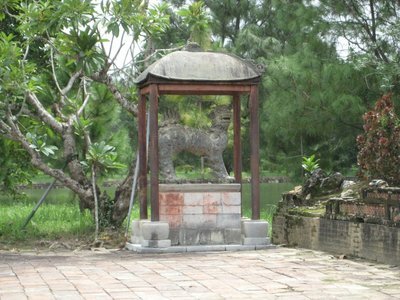 It was unusual in that Tu Duc was poet and a romantic who built an asymmetrical grounds for himself. The standard autobiography carved into a stele (tablet) was also very self-critical, as he felt he was losing Vietnam to the French and his slave labourers hated him for building the Mausoleum so fast. As I did this, Jenn had an interesting conversation with a local family. "How old are you?" "38," Jenn answered. Much whispering, then somone told her, "By now Vietnamese women maybe have 10 babies!" 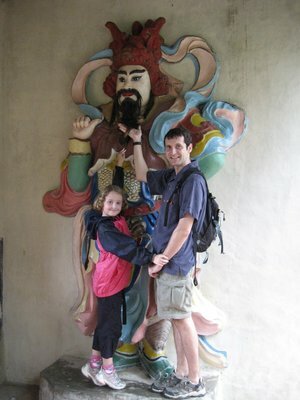 The Mausoleum of Minh Mang, which we saw after a forgettable (or maybe un-forgettable lunch) was a stop we all enjoyed. It was easy to see the symmetry of the Mausoleum's layout, reflecting the order of this emperor's reign (1820-1841). One of the details we liked was the pair of "nee," (I have no idea of the spelling, actually) a mythical animal that eats unwanted ghosts. They are brothers to the dragon, apparently. We were back at the dock in Hue right at 4 PM, an eight-hour trip, and we went for an early dinner and then another DVD from the hotel's large, mostly-pirated collection. Today we walked over to the past Hues' Forbidden city and looked around. Most destroyed, but who cares, its great. Tour group of high school students there, and many mini models of palace. Wanted to go to market, but said no and had lunch. Walked back over bridge to hotel, looked at movies and saw Trasformers. Me: "okay, okay, okay." Them "we'll bring it up." Rested till I really got the party started (by doing rock star moves) for the last two hours. Had qucik diner at Ushi's, got pringles and watched Transforemers. 2 hours and 20 min! Good night. Thirty degree plus heat greeted us despite the early start this morning, the first time we've had a wilt-inducing temperature in a couple of weeks. 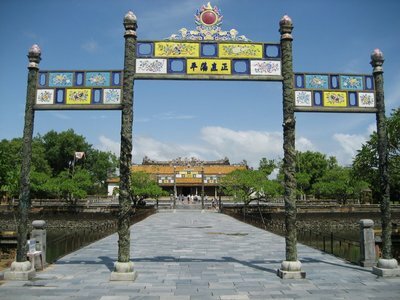 We were off to "The Citadel" (or 'forbidden city lite,' you might call it), Emperor Minh Mang's 19th century royal enclosure largely modelled after Beijing. Despite being a royal residence until 1945, much of it is in advanced disrepair. Weather and warfare are to blame. What's left is fun to explore, even the overgrown parts, and some key buildings are fully restored and kept up. The moats and walls are very impressive. Another hall is supported by 80 two-tonne wooden columns painted yellow and red (imperial colours). We didn't see much of evidence of why the Mandarin halls were once called the "Forbidden Purple City." 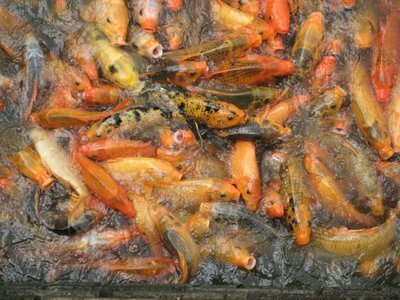 Anica liked feeding the already over-sized goldfish in the pond just inside the south gates. 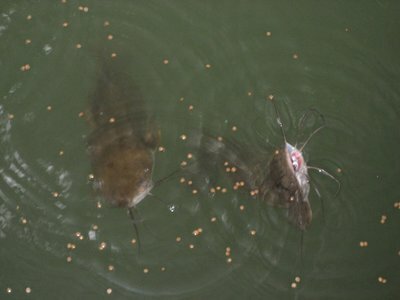 They swarmed and climbed over each other in a frenzy to get the food. Our own appetite was sated at the tastefully-named "DMZ Cafe", where the pizza was so good that we ordered a second. 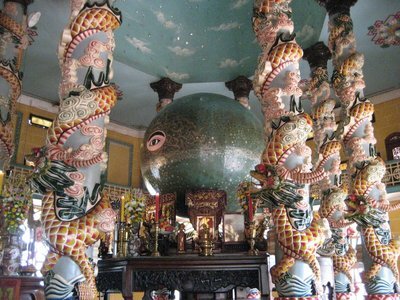 We have officially done all there is to do in Hue as of mid-day today. 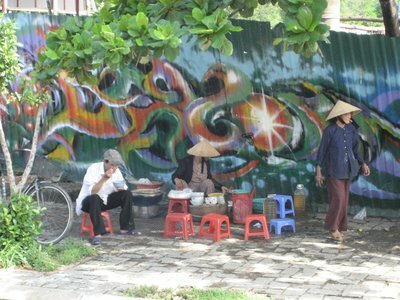 That''s fine, since we deliberately cut out a stop in Hoi An to slow down our pace and have some quiet afternoons and evenings. 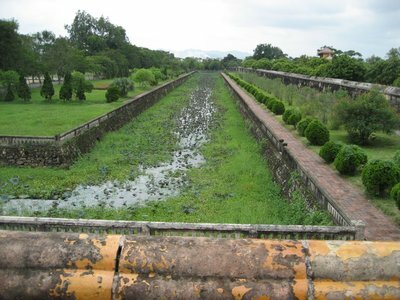 Hue is actually a charming city of just under a million people, although it seems much smaller than that. Today we walked - wandered really - to see what the city was like off the beaten path. As usual, this was quite rewarding. The cyclo-drivers vanished within a few blocks of the riverfront, and so did all the other tourists/Westerners. People we passed broke into huge grins and gave waves and "hellos." Chancing upon a wet market, we had to prepare Anica by reminding her that people in the crowded market will try to touch her and talk to her. She held up great, and we got to move through the fish-heads, shrimp and exotic produce, then follow a laneway out of the market to see more of "hidden" Hue. After three hours out walking around, we feel we saw a lot more of the city than some visitors do. Having now been all over Hanoi and Hue, we've also noticed that Vietnam is the first country we've visited that doesn't have the Western chain food big four: McDonalds, Starbucks, KFC, and Pizza Hut. I wonder if that's true in Ho Chi Minh City, too? 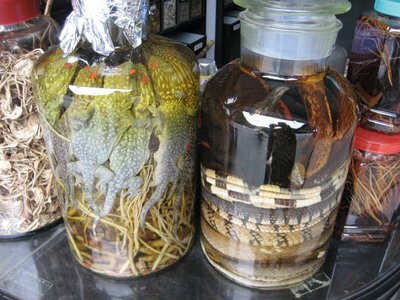 No KFC in Hue, but look what you can get pickled in a jar at the corner pharmacy!